The entrance to the cave near the Greenhouse. After you accumulate 25,000g in total earnings, Demetrius will visit the Farm in the morning and inform you that he would like to use the cave to set up research specimens. He'll give you the option to choose between fruit bats (which leave fruit in the cave) or mushrooms. This choice is permanent and cannot be reversed. Interior of the cave showing a Pomegranate left by fruit bats. Fruit bats leave various fruit in the Cave on your farm (on average of 0.8 per day). This is a great option for making Artisan Goods as it gives you a slow but steady supply of fruit even out of season. It also helps complete the Artisan Bundle in the Pantry in the first year or two, before you have enough money to buy all the necessary Fruit Trees. Fruit Tree fruits make excellent gifts for villagers because they are universal likes, readily accessible early in the game, and do not require a kitchen. Gifting may be the best late-game use for fruit, other than making Artisan Goods, Shipping them, finishing the Bundles, or eating them for extra energy (even though they don't replenish very much health). Fruit found in the cave can be of any quality (normal, silver, or gold). If the Botanist Profession is chosen, the fruit will be iridium quality. Each fruit picked up from the floor of the Cave will give the player 7 Foraging experience points. Mushroom plots in the cave. 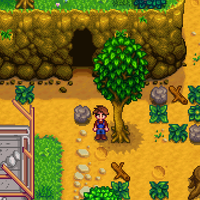 Six plots will be added to the cave where certain types of mushrooms will randomly grow. Five different types will appear, including all four that are required to craft the Life Elixir. Even though Common Mushrooms, Morels, and Chanterelles are the ones that most commonly appear, this is still the best way to craft the elixir as often as possible. This makes the Mushroom option a great one for those who love to go into The Mines, especially since most mushrooms can be hard to find otherwise. This is also a good choice for players that have grown, or plan to grow, fruit trees and do not need the extra fruit provided by the fruit bats. Cave mushrooms can be harvested daily, but never more than once a day. The six plots begin generating them the morning after Demetrius sets them up, and again every morning after a harvest. Apparent growth time is 10 hours (needs verification), so new mushrooms will not be available until after 4 PM. Like crops, mushrooms that are ready for harvest remain unspoiled until they are harvested. If the player harvests existing mushrooms before 7 AM, there will still be no more available until 4 PM the following day. Thus, if the player goes to bed without harvesting mushrooms that are ready, one day's production is missed. Mushrooms grown in the cave are always of normal quality, even if the Botanist Profession is chosen. Harvesting mushrooms from the Cave does not award the player with any Foraging experience points, and the Gatherer Profession does not award double mushrooms. Common Mushroom Slightly nutty, with good texture. Red Mushroom A spotted mushroom sometimes found in caves. Purple Mushroom A rare mushroom found deep in caves. This page was last modified on 19 February 2019, at 18:54.